Succulent chicken legs are marinaded, roasted and served with a piquant chilli sauce. This naturally gluten-free recipe tingles with flavours of Portugal. 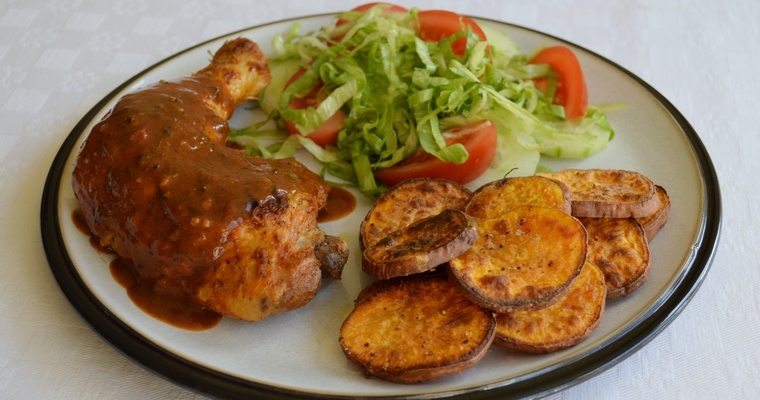 Piri Piri chicken is probably the most famous Portuguese dish, although it actually developed in Africa. Angola and Mozambique were once colonies of the Portuguese empire, and it was Portuguese settlers who introduced chilli peppers from South America. ‘Piri piri’ simply means ‘pepper pepper’ in the Swahili language, and describes a punchy red sauce that is most commonly served with grilled chicken. Leave to rest – this gives the muscle fibres time to relax and reabsorb the meat juices that get driven out during cooking. Otherwise the meat juices will run out and be lost when the meat is cut, resulting in tough, dry meat. Marinade the chicken. The day before, make the piri piri marinade. Put the garlic, scotch bonnet chilli and salt in a pestle and mortar, and grind to a smooth paste. Scrape into a Tupperware container and add the remaining marinade ingredients (oregano, black pepper, paprika, parsley, tomato purée, lemon juice, olive oil and white wine vinegar). Use a hand whisk to mix until fully blended. Add the chicken legs. Use the tip of a small, sharp knife to make a small incision in the skin of each thigh, stopping before you reach the meat. Slide a finger into the incision and gently separate the skin from the meat, working slowly to stop the skin from tearing. Once you have created a pocket, spoon in some of the marinade. Massage from the outside to distribute evenly under the skin. Rub the remaining marinade all over the outside of the chicken. Cover, and leave to marinade in the refrigerator for at least 4 hours, but preferably overnight. Cook the chicken. The next day, remove the chicken legs from the refrigerator 30 minutes before cooking, so they have time to come up to room temperature. Arrange the chicken legs in a single layer in an appropriately-sized ovenproof dish, that is neither too large nor too snug (when added, the stock should come about halfway up the chicken). Scrape in the marinade and pour the stock around the chicken. Cover the whole dish snugly with a double layer of tin foil. Preheat the oven to 180°C/355°F. Cook the chicken for 1 hour. Remove the tin foil, and return to the oven to cook, uncovered, for another 20 minutes to brown the skin. When done, the juices should run clear and an internal meat thermometer should read 75°C/165°F. Reduce the sauce. Once the chicken legs are cooked, lift out and place on a plate, scraping off any marinade with a spatula. Leave to rest for at least 10 minutes while you reduce the sauce, covered by a double layer of tin foil to keep warm. Pour the marinade into a saucepan. Skim off the oil from the top and discard. Heat over a high heat and boil rapidly until reduced to a thick sauce – about 20-25 minutes. Transfer the chicken to a plate and pour over the sauce.